2. 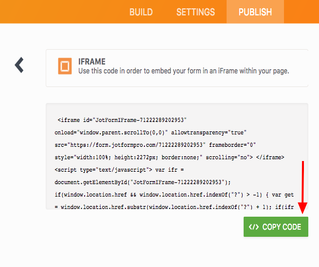 Click on the "Embed" tab then select "iFrame" from the embed options list. 4. Copy the code provided at "Paste this code on your website". 5. 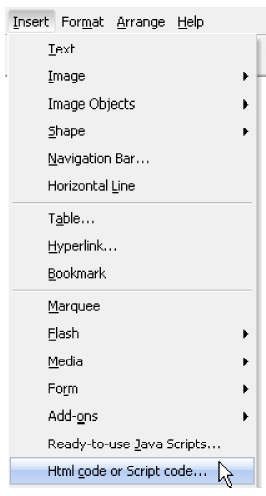 Select Html Code or Script Code... from the Insert menu. 6. Paste your HTML into the HTML Editor window. and pressing Ctrl-V on your keyboard. Hi, How can I make my people open a certain page with different pins (not password)? sorry have form on web page and, when sendind my comments iam not see comments on page. buna , as vrea sa stiu dupa ce iti expira web page maker-ul poti sa introduci un cod in care ti se reinoieste valabilitatea lui . dar de unde pot face rost de acest cod ? daca stiti va rog frumos sa imi ziceti si mie .. So far so good really easy to use and professional looking. Does JotForm have an option for respondents to log in prior to editing submission? How can i make my form transparent? I am using Web Page Maker V2; in wich parte must I paste the code to see the form into my page ?